In spite of his apparent winning the public relations battle with Republicans over the debt ceiling crisis, President Barack Obama is still stuck in the mid-forty percent range of job approval – the danger zone for re-election. Obama has now completed 60 percent of his term – the 10th quarter – and his approval averaged 47 percent during the last three months. Of course, incumbents tend to be re-elected, and there are still two- to three-quarters for the economy to recover (7 out of 10 presidents were re-election since FDR, or the beginning of the modern era of polling). But, in general, Obama’s below 50 percent approval average is not a good sign, especially since in the short-term he’s tending to hold his own or win many confrontations with Republican opponents. For example, Obama has used his pulpit and speaking ability, backed with tested messages, to win the positioning in the debt ceiling debate. He wants the balanced approach. He’ll compromise. Washington is too partisan; it doesn’t work. He wants to protect the most vulnerable and most popular programs. He supports shared sacrifice, not tax breaks for the rich. Republicans are extreme; they won’t compromise. But yet, except for a few weeks after Osama Bin Laden was killed, Obama can’t move his approval numbers up. In fact, in the latest daily Gallup poll, he’s dropped to 43 percent, equal to his all time low. Why? · Although he’s trying to run as a moderate and against Washington, his liberal image as the leader of the D.C. Democratic Party is more established than in 2008. Also, being the incumbent in office 40 weeks makes claiming to be an outsider a hard sell. · The economy continues to lag and people are becoming more pessimistic about the immediate future – bad news for presidential re-election chances. A recent Gallup poll records 73 percent of Americans believe the economy is getting worse, a level of pessimism not seen since the depth of the recession in March of 2009, the beginning of the Obama/Pelosi recovery effort. · Obama needs to be able to look fiscally responsible, but the Democratic House and Senate caucuses’ insistence on revenue increases and Republican House’s membership refusal to accept them have blocked a compromise. As president, he gets most of the blame for gridlock and it makes him look weak. · Democrats, and especially liberal and minority Democrats, remain supportive of the president. But, independent voters have been growing much more skeptical and volatile with his approval rating. One problem exasperated by the debt ceiling debate is that Obama must reassure liberals and demand revenue increases while resisting spending cuts. But, that makes compromise preferred by independents harder to achieve. Although Obama has a slight advantage nearing the last year of his term, the Republican nomination looks increasingly valuable as the nominee will face a very vulnerable incumbent. The Tea Party movement (TPM) is probably only about 10 to 20 percent of the national electorate, but it has held a veto power over debt talks. Its influence reflects its strategic location. TPM support is concentrated in the Republican Party, they are active and can produce a primary. TPM serves as a brake on Republican representatives’ normal instinct to follow their leaders and compromise. Michele Bachmann, one of the most TPM-identified candidates, has about 16 percent of Republican Party support in national polls, with Herman Cain and Ron Paul combining for another 20 percent. Hence, the TPM may represent about a third of the Republican voters. Another reason TPM has outsized influence is because its issues of reduced debt and less government spending are likely to be dominant in 2012. Republicans will, of course, run on the issues, but even Democrats and especially the President will have to give, with greater and lesser levels of sincerity, support. If the Republicans controlled the Senate, the debt ceiling discussion would be much different today. Although Democrats would try to use a filibuster, they would be in a weak and defensive position. But, Republicans failed to win the Senate in 2010. Most observers believe it’s possible in 2012 – and two of the four seats needed are in the twelve western states. Nevada Republicans need to hold the seat. Dean Heller was appointed and will likely be in an expensive, tough race. Harry Reid wants the seat and will raise the money. Montana is a top priority for a Republican pick-up, but Democrats have found good candidates in recent elections. Jon Tester is a good fit. His problem is being a Democratic incumbent. New Mexico, as an open seat, will be a powerful fight, and has already attracted primaries in both parties. Republicans are pleased Gov. John Hickenlooper said he believes Barack Obama would have a “hard time” in Colorado in 2012. This is not a big news item. Our June 28 blog, “Obama Could Lose Colorado,” described the President’s challenge in the country’s ultimate swing state. In 2010, the Democrats’ run in Colorado that begun in 2004 ran out. Republicans came back, sweeping most of the state’s competitive races, except the Senate. Democrats held it by only 40,000 votes. In that election, Obama was a drag-on ticket. Bennet was a proxy for Obama, Washington and national Democrats. But, he ran a very well-funded, good campaign. Hickenlooper’s statement, while accurate, was not very political. But, Hickenlooper is a Democrat mostly by convenience. Running for governor was his first partisan job. No doubt, he will be more cautious with his predictions given the tough partisan environment in 2012. But, the party shouldn’t expect much rah rah from the Hick. Michael Hancock begins his term as mayor with considerable good will and facing significant challenges. His campaign highlighted his exceptional life story and his good temperament. He promised more continuity than change and emphasized that his long government service experience put him in position to begin on day one. Except for the Stock Show imbroglio, his start has been smooth and appointments appear satisfactory. But, Michael campaigned on the economy and inherits a process to get Denver’s fiscal house in order. Those will be the two big tasks he must address before the end of the calendar year. • Hancock made the point the city budget must be balanced and will. The contrast with Washington D.C. will be welcome. But, he is also committed to some structure reforms, which will come out of his transition group and the Vidal financial task force. Most will require council action. Some will require charter changes and voter approval in November 2012. • Denver has been without a serious economic development team or strategy during a good part of this recession. Pulling together the players and a list of opportunities is critical. • The National Western Stock Show has needed help for more than a decade, while the recent effort was poorly executed, there is broad recognition something must be done and public sympathy to help. Hancock has some room to maneuver if he’s prepared to take the bull by the horns and be bold. Rome has just made Archbishop Charles Chaput a political player in the New York to D.C. corridor. As the new archbishop of Philadelphia, Chaput will have a platform for his strong political views. His appointment already received a long article in the New York Times. Not unexpectedly for the liberal, secular beacon of U.S. newspapers, it focused on the child abuse scandal in Philadelphia and Chaput’s strict views on abortion and gay marriage. But, they missed his real talent and message. Chaput is an aggressive advocate for people of faith being heard and being active in the public marketplace. His well-received book, “Render unto Caesar,” is an expression of the right and duty of Catholics to engage the secular forces that dominate much of the media and politics of 2011 America. He is especially tough on politicians who run as Catholics, but actively oppose Church teachings on abortion. And, Chaput used the diocesan newspaper to air his views and was active in the legislature on bills of interest. Denver, of course, had its own clergy scandal. Chaput handled it briskly. Many observers point out that while victims received comfort and, in some cases, compensation, the professional litigators were not able to turn the Colorado Diocese into a bank for remote and extravagant claims. Indeed, Chaput will likely receive the Cardinal’s red hat and could also become a protagonist in the 2012 presidential election. Although it appears the National Western Stock Show’s move to Aurora is a done deal, it is, in fact, dead politically in Denver. No tax will be passed to assist the move. Incentives, which are often illusionary and accrue mostly to private interests, are unlikely to overcome Denver voters’ aversion to losing the Stock Show and being asked to pay for it. More likely, if the proponents move forward, local political entrepreneurs will put a “keep the Stock Show in Denver” initiative on the ballot and block the move. However, the poor choice of moving the Stock Show out of Denver opens an opportunity to address the deeper problem. Denver isn’t in the economic development game today. And, Denver voters might be a little more regionally minded if they felt it were. In the past, Denver business and political leaders combined forces to develop new projects and address economic problems. The Stock Show has complained about its space problem for more than a decade. But, Denver is without an aggressive economic development strategy and team. The Denver Chamber focuses regionally, and Denver’s own economic development leadership has been both unimpressive and distracted during a nearly two-year transition as Hickenlooper shifted his role from citywide to statewide interests. The new administration has an opportunity to get serious or, if not, it will get beat. 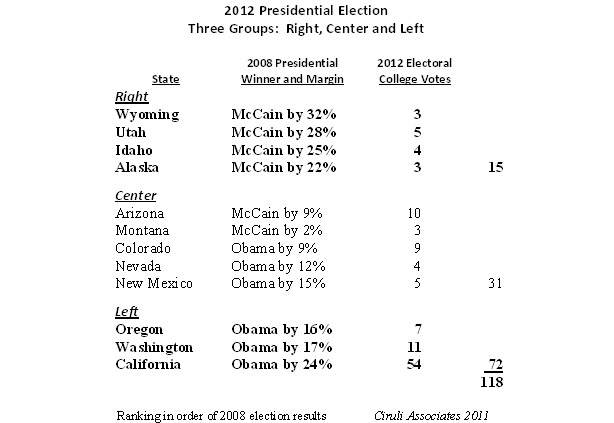 Colorado is the state in the closest political balance approaching the 2012 presidential election. Although Barack Obama won it by 9 points in 2008, the Republicans took much of it back in 2010, except a Senate race, which the Democrats clung to by 2 points, or 40,000 votes. The Buzz will provide ongoing coverage of the presidential election from the perspective of the 12 western states in the continental U.S. Colorado occupies the center, with Arizona, Montana, New Mexico and Nevada closely clustered around it. FOX News is beginning to focus on western battleground states. Will Romney Win the Colorado Caucus? 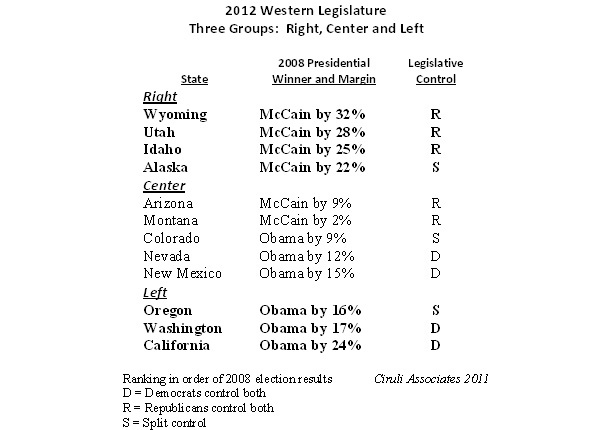 The 2010 election shifted eleven legislatures from Democratic control to either Republican or split between the parties. Republicans now control 25 – the most in five decades – to 16 for Democrats, down from 27. That shift, rise of the Tea Party and continuing concern about the states’ impact on job creation has stepped up the effort around the country to cut state labor costs and budgets rather than raise taxes and other revenue schemes of the past. In the west, there is the usual distribution of parties among the states, with Republicans controlling most legislatures in more conservative states and Democrats in control in the more liberal states. Most intermountain western states are frugal as a political culture and western states in general have balanced budget amendments. Even California was able to pass a balanced budget (with some rosy assumptions) in time for the first time in many years. Ron Brownstein, one of the best national political reporters (National Journal and commentary on CNN, ABC and others), interviewed Bill Clinton at the Aspen Ideals Festival last 4th of July weekend. Clinton argues that the difference between today’s slow recovery and the good economic times in the mid 90s is the current lack of a growth engine, such as the information revolution he benefited from. He supports the Democratic Party’s theory of government investment in infrastructure, education and basic research. The problem, of course, in today’s political and fiscal environment, there is no money for investment. Moving money from entitlements, which he advocated, is resisted by his party and especially its left wing, represented by Minority Leader Nancy Pelosi. One reason Hillary Clinton isn’t president is that the left wing of the Democratic Party, which controlled the 2008 nomination with the help of a united Black community, didn’t trust her to maintain the liberal positions and its special interest agendas. It has been two years since the recession ended and the recovery began (June 2009). But, like the county at large, the Denver metro retail economy, as measured by sales tax revenue, stalled in May. After consistent 5 percent to 7 percent increases for more than a year, May registered a decrease of half a percent (.41%) from May 2010. The timing may help motivate Washington to get a budget deal. It should motivate Denver to think more aggressive about job and retail sales growth and find a winning solution for the National Western Stock Show. 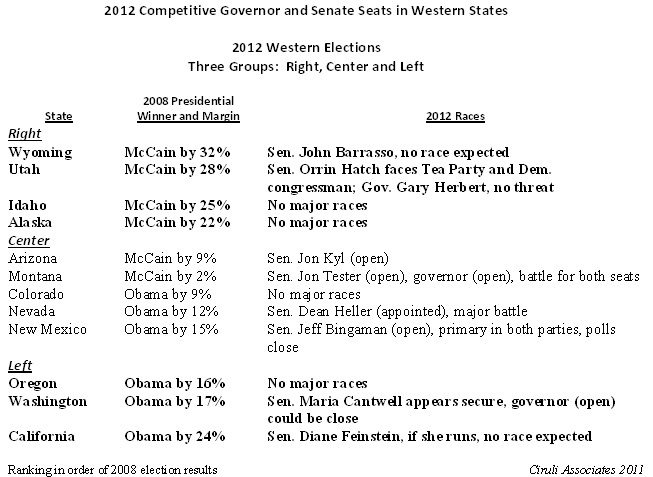 The West may decide the 2012 presidential election, and it will offer major contests for U.S. Senate and governorships. The partisan performance in the twelve western states can be divided into the very conservative, very liberal and swing states. In the conservative states, Republican presidential candidates win easily, and the only recent local contests have been intra-party. For example, Utah and Alaska in 2010 offered high-profile intra-party senate fights: Utah’s long-time incumbent Senator Bob Bennett lost in his party’s convention, while Alaska Senator Lisa Murkowski reversed a party primary decision by winning as a write-in candidate. In 2012, Utah Senator Orrin Hatch will face a Tea Party-type challenger in the Republican family and possibly a surprising challenge from a conservative Democratic congressman, Jim Matheson. In the three states on the Pacific Coast that regularly vote Democratic for president and usually for senate and governor (periodically a liberal Republican can win) – Oregon, Washington and California – only the Washington governor’s race appears competitive in early polls. The seat is open, but Democrats have dominated the state in recent years. Diane Feinstein, California senator since 1992, is playing her usual melodrama of indecision about running. But, she likely will run and be hard to challenge. The battle in the West, both in the presidential race and for senate and governor seats, tends to be in the five states more south and central and in the center of the political spectrum: Arizona, Montana, Colorado, Nevada and New Mexico. Barack Obama needs to win three, and thinks he might be competitive in four. Arizona, with Senator John McCain on the ticket, was beyond reach in 2008, but this year it is on the Democrats’ target list. The contest for the open seat of retiring Senator Jon Kyl is still sorting out. Montana may offer the fiercest statewide races, although it’s unlikely to be targeted by the White House in a close national race. Democrat Senator Jon Tester will have a major battle to hold his senate seat, and the governor’s seat is open with the retirement of Democrat Brian Schweitzer. Republicans believe they can pick up both. Although there are no major races in Colorado, Obama expects it to be very competitive. In 2010, Democrats hung on to a senate seat and the governorship with massive amounts of money and well-focused campaigns. Nevada will see both a major senate battle and a competitive presidential race. New Mexico has switched sides in the last two presidential races by close margins. The open senate seat has produced primaries in both parties, highlighting the expected closeness of the race. Both parties’ presidential campaigns will more than likely target four states in the West – Arizona, Colorado, Nevada and New Mexico. Also expected to garner national attention are two western governors’ races, four competitive senate races and one senate seat decided by intra-party action. Mitt Romney has a head start in Colorado with much of the Republicans’ political establishment getting on board early. But, in 2010, a new force in Republican politics emerged. The Tea Party took over the caucus process and even won primaries with their candidates. Their effort was discredited by poor candidates and campaigns. But, their issues are dominant, and it remains to be seen if they are ready to march for a Michele Bachmann or other Tea Party type candidates. Romney won the 2008 Colorado presidential caucus, but he did so poorly elsewhere on Super Tuesday that, before the end of the week, he dropped out of the race, leaving the field to frontrunner John McCain and a trailing Mike Huckabee. Super Tuesday in 2008 was also critical for the Democrats. Instead of ending the race, Barack Obama’s broad wins, especially in caucus states, signaled the battle between him and, up to that point, frontrunner Hillary Clinton would go on for a long time. Twenty-four states held primaries and caucuses in 2008, which selected 52 percent of Democratic delegates and 41 percent of Republicans. Earlier 2008 events had propelled McCain into the lead with wins in New Hampshire, South Carolina and Florida primaries, but Huckabee’s win in the Iowa caucus and Romney’ early strength in the caucuses in Wyoming, Nevada and Maine and a primary win in Michigan had him in the game. Clinton and Obama had split the earlier contests in what was clearly developing as a bitter, tough battle. Obama’s Iowa upset, countered the next week by Clinton’s New Hampshire recovery, set the stage for charges and counter charges made by both candidates and their supporters trying to win the African-American vote in South Carolina. Obama mostly won it and the state. At the conclusion, Obama won 847 delegates in 13 states, and Clinton 834 delegates in 10 states. The Democratic primary vote was nearly even. McCain’s lead after Super Tuesday was so substantial, the race was effectively over. The 2012 presidential nomination schedule has been changed. Republicans, in an effort to pull back the decision a few weeks, have shifted the front of the schedule back. A new schedule is still being formulated at the state level. With the weekend announcement of Senate President Brandon Shaffer that he intends on challenging first term Republican Congressman Cory Gardner in the 4th District, Colorado Democrats now have filled out their card to take back the two seats lost in 2010. House Minority Leader Sal Pace has already begun campaigning against first termer Scott Tipton in the Western Slope and southern Colorado based 3rd District. Both the 3rd and 4th districts are marginally Republican. Hence, the redistricting map, not due until the end of the year, will be critical. Although congressional candidates can move into a district, in the case of Pace and Schaeffer, they would need Pueblo and Longmont in the respective districts. Considering the districts in their current configuration, Pace has a better chance than Shaffer, but the new lines will likely be dispositive.